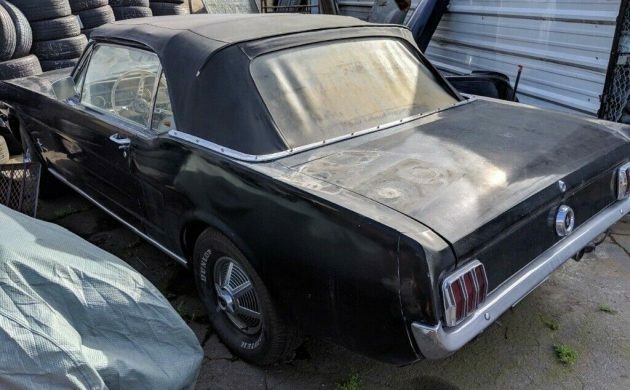 On the surface, this 1965 Mustang Convertible shows quite a bit of promise as a project car. 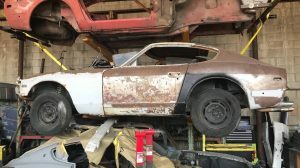 When you delve below the surface, you do find some of the rust issues that are typical of Mustangs of this era, but the car certainly isn’t beyond help. 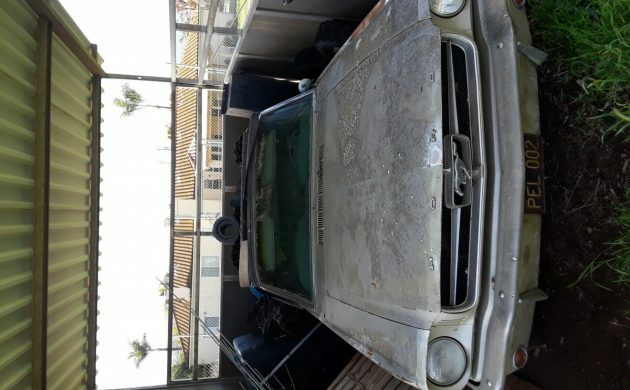 Located in Oakland, California, you will find the Mustang listed for sale here on eBay. Bidding has reached $7,100, but the reserve hasn’t been met. If you just have to have this car, then you can always exercise the BIN option, which is set at $9,995. As I said, on the surface, this does look promising. The photos make things a bit difficult, but it does look like the lower quarter panels are pretty decent. The owner also says that the rockers are good, so that’s two potential trouble spots seemingly ticked off the list. Unfortunately, the news isn’t quite so good once we climb under the car. The photos are, once again, a bit ordinary. However, they aren’t ordinary enough to hide the fact that rust is definitely visible in the front frame rails. We don’t get much of a look at the rest of the underside, but it will need some careful checking. The Mustang isn’t a numbers-matching car, because what used to reside under the hood was a T-Code 200ci straight-six. 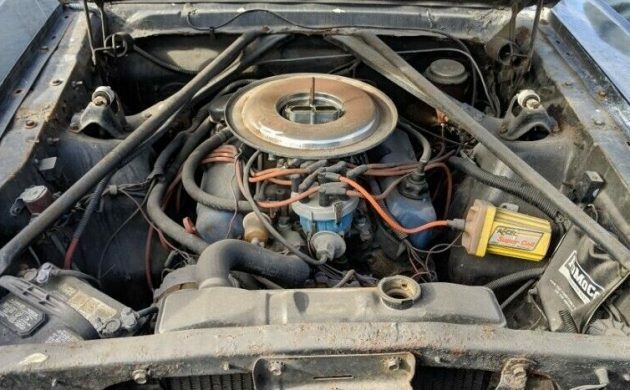 That has made way for a V8, although the owner is unsure whether this is a 289 or a 302. This is backed by an automatic transmission, while the car also wears 5-lug wheels. 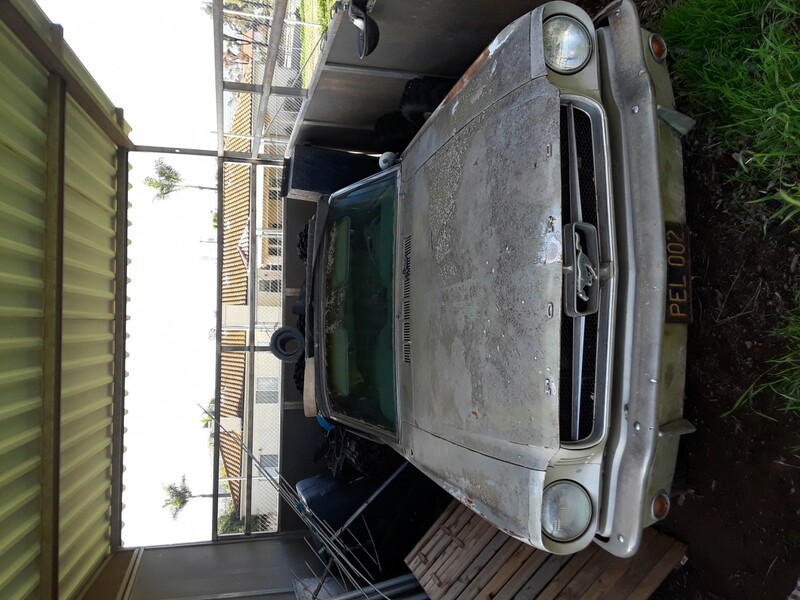 The owner gives us no information on the mechanical state of the car, so hopefully, he will be willing to answer a few questions for anyone considering buying the car. The condition of the interior is generally quite surprising. The white upholstery has held up well, and looks like a weekend with some cleaner should make it look quite presentable. 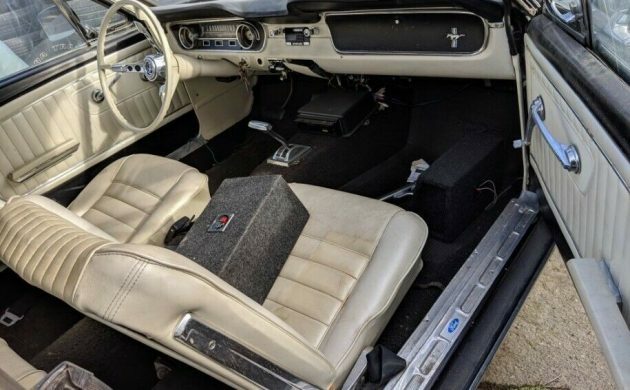 The carpet appears to be faded, but it might just respond to a dose of dye, while the dash pad looks to be intact. I look at the aftermarket stereo that has been in fitted into the dash and am disappointed to see how the dash has been cut to install it. This could be repaired, although I tend to suspect that the next owner will probably just fit another stereo. This is not a slight on them, but a simple fact of life. This is not a numbers-matching car, so there is less expectation that it should be restored to original. This leaves the way clear for the new owner to put their stamp on the car without destroying a classic. While many classic cars experience rises and falls in the market, the Mustang has been one of the few that have performed consistently well, regardless of their specifications. 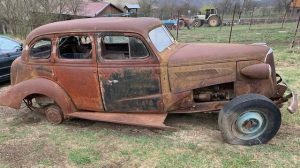 There is a greater focus now on the preservation and restoration of original cars than at any time in the car’s history. 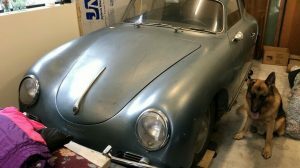 This one isn’t an original car, and that leaves the next owner the option to pursue personalizing the car without destroying a classic. There will be plenty of people that will find this to be an attractive idea. I vividly remember cajoling my mother into taking me to the local Ford dealer to see the Mustang I when it was touring the country to hype interest. It was tiny but it was the biggest thing that happened that year for me. Flash forward a few years and my sister was dating a guy whose family owned a Ford dealership. He was driving a dark blue 260 V8 convertible with a 4-speed and came to visit. He let me take the car for a date. It was SOOO cool. Later on a couple of fraternity brothers had 1st gens, another had a ’67 convertible. After college I saw George Follmer drive an orange fastback at MIS in the Trans Am race (the same race that featured a silver ’64 Tempest, but that’s another story). A few years on I dated a girl with a Mustang II Ghia and lived to regret it. 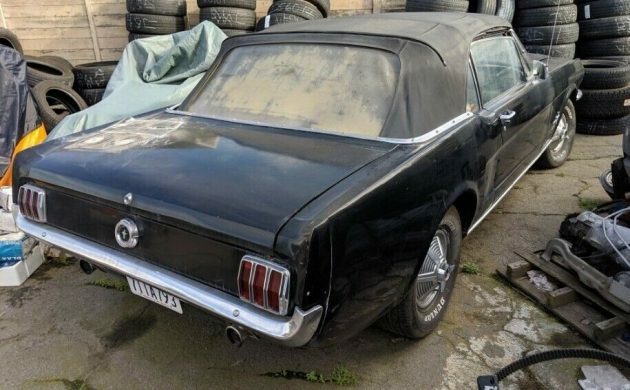 Life went on and the time came to petition the family for Dad to buy a Mustang. I just wanted a cheap used Fox body but Darling Daughter and her mother recoiled in horror and insisted on a ’98 convertible. They even picked out the color – Pacific green with a tan top and interior. I taught both of my kids how to drive in that car. I kept it for 10 years. The time came to replace both mom’s Town & Country minivan and the ‘Stang. I had intended to dump the van and keep the convertible in the interim but the van was in better shape. I sold the Mustang to a neighbor whose teenaged daughter was thrilled to get it. Then I started driving Corvettes, the other American Icon. But I still check out Mustangs and would gladly buy another if the opportunity (& finances) permitted. The fact that an aftermarket industry rivaling the old Model A replacements (see J. C. Whitney) speaks to the gearheads’ love affair with the Mustang. I wanted a Corvette first since I saw the 1958 first. But I bought a Mustang first since I could afford one first. And that is the essence of the original Pony Car. If the inner rockers are good, that’s huge-those are a *itch to replace. might be able to do some good welding up where the front rust is, but a good look over is good including the cowl plenum. 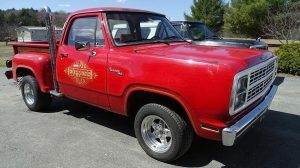 for 10 grand looks like a steal if its that nice. That’s a contradiction of a unibody Ford- beautiful on one and and a rust bucket on the other!! Good luck to the new owner!! 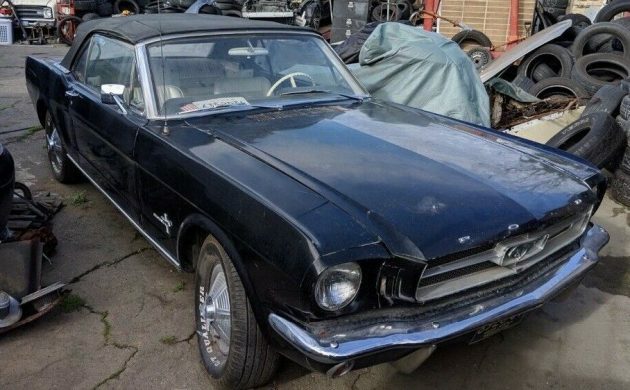 I’m second owner of this 65 Mustang convertible. It was owned by a corporation in Los Angeles. The water pump went out which on these long stem blade runners water pumps was common and I picked it up for $125. They were told the block was cracked and the engine was no good. Well That was in 1969 today it sits in my portable barn wanting to hit the road again. Been now twenty five years since but it’s still registered and ….